An owner of a J109 contacted us this week to see if there was any way we could breath new life in to his B&G Hydra 2000 racing instrument system. Much as he would have liked to install a complete new instrument systems, high performance racing software from Expedition and a couple of wireless tablets, after being forced to buy a new set of sails, his budget was seriously depleted. 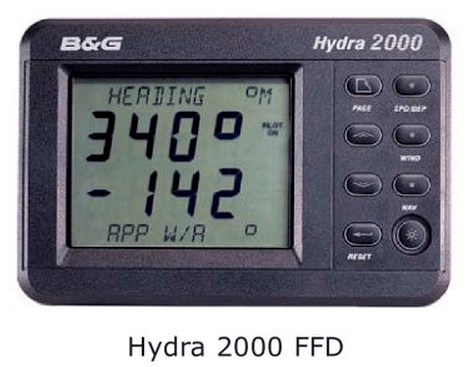 The Hydra 2000 performance instrument system from B&G was really popular with racing yachtsmen in the late 1990s and early 2000s and although it has been replaced by the H3000 system for the last 10 years, there are still a lot of boats with these systems and it is a tribute to B&G that many are still giving good service. The basic system consisted of the transducers, feeding in to the main processor unit and displaying the data on a series of Full Function Displays (FFDs) and large 20-20 displays. In order to get data out of the system, you needed to have an 8 button NMEA FFD and this was connected to the system via a round white NMEA junction box. 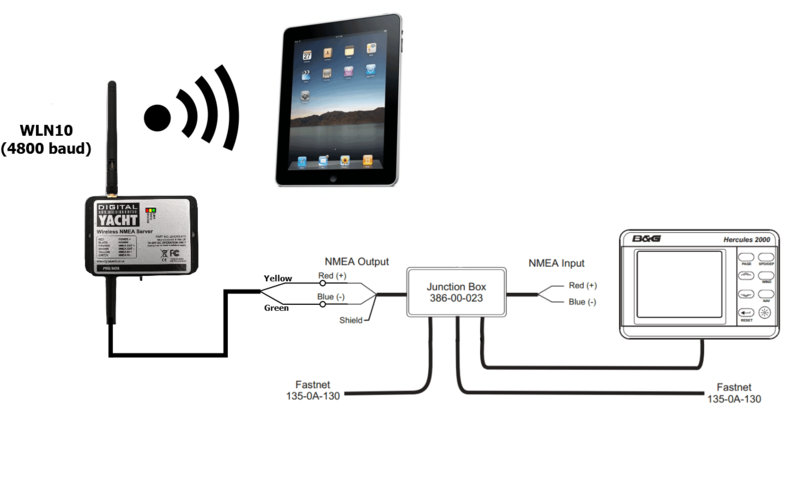 The plan was to connect our WLN10 Wireless NMEA Server to the FFDs NMEA output and then to wirelessly stream the NMEA data to the popular iRegatta App running on an iPad. Identifying the right wires was not so easy as both the NMEA Input and Output pairs of wires were Red(+) and Blue(-) but opening the NMEA junction box and looking for the Violet NMEA Output(+) wire from the FFD was the best way to identify them. Then it was just a case of connecting up the WLN10 as shown below, turning the system on and ensuring that the Yellow “Data” LED on the WLN10 started to flash. Once installed any wireless computer/tablet/phone could be connected to the WLN10 and with suitable software/app receive the wireless NMEA data. This particular customer had installed iRegatta on his iPad (£13.99) and was very impressed when all of the instrument and GPS data suddenly started to appear on the displays. With performance racing features, polar calculations and good logging/analysis facilities iRegatta seems to be excellent value and very useful for club racers or in fact any yachtsman who likes to get from A to B in the quickest, most efficient way. Thank you so much for your inspiring blog. I recently purchased a boat with a B n G Hydra 2000 instrument suite and autopilot. It is an early model and I cant find the junction box. I would love to install the WLN10. Has anyone else had success? I don’t believe the junction box is critical as it is literally a box with some terminal connectors inside and I would not be at all surprised if it is not fitted in some installations and the cables just spliced together. What is critical is whether you have an Full Function Display (FFD) with an NMEA interface or not. If you do then you should be able to connect one of our WLN10 units to this or if you have a performance processor box in the Hydra system, this will have a couple of NMEA ports on it and you could connect the WLN10 to the PPB rather than the FFD. Next time you are on the boat, I would do a bit of research to see exactly what units you have and then work out the best place to take an NMEA output from.